Picture from three5four0 : What No Rain? To say Easter weather this year (2011) was unusual, is a bit of an understatement. It has proved to have been our summer with temperatures hitting 28/29 for several days in a row. August on the other hand more resembled autumn! 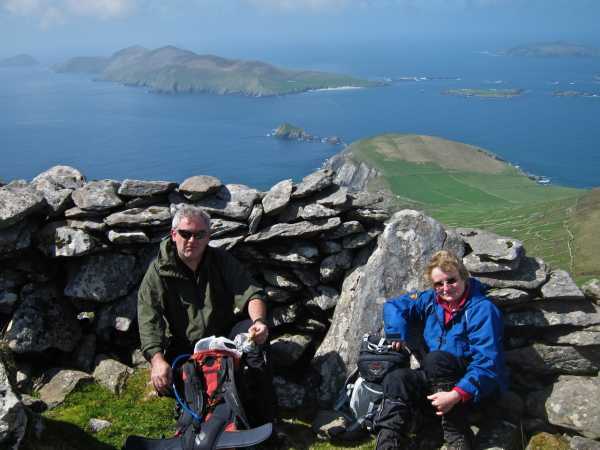 Here on Mt Eagle with the Great Blasket Island in the background, we all came kitted out in Paramo, expecting the usual sleet, mist and rain of Easters past. Not the positively Mediterranean weather we got. However, 3 weeks later I was camping in snow in Scotland! Needless to say our Traverse of the hill from Ventry Harbour car park, to Slea Head and the Dingle Way back round to Ventry was superb. With only the small redirected section of the Dingle Way, along the Slea Head road, spoiling it slightly.